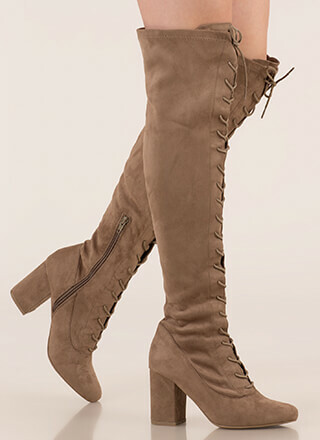 Slouching isn't always a bad thing... Just look at these boots! 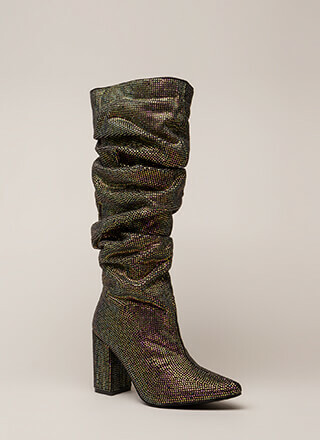 Denim, peep-toe, over-the-knee boots feature a stiletto heel, a wide opening, a slouchy shaft, and an allover, spotted, slightly abstract leopard or cheetah print. Shoes are finished with a low platform, a ridged sole, and a side zipper for easy on and off. Pattern placement may vary.